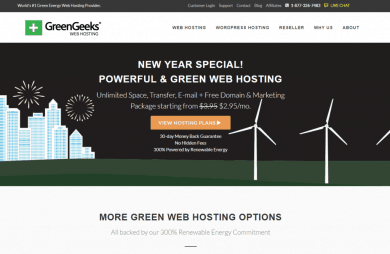 GreenGeeks offer one shared web hosting plan for $2.95 per month (regularly $9.95/mo). Their plan includes a free domain name, free website migration, 1-click installer, advanced security, e-commerce ready, SSH command line, and expert 24/7 support. GreenGeek’s WordPress hosting comes with free 1-click WordPress install, unlimited space, the same guarantee of 99.9% uptime as their shared web hosting, and lots of features. Their security features include automatic updates, account isolation, real-time security scanning, and DDoS protection, all included in the price. As with their other hosting packages, the WordPress hosting plan comes with 24/7 monitoring and daily backups, with 24/7 expert support if required. Reseller hosting isn’t something we come across as often with larger web hosting companies, however, GreenGeek’s have a range of reseller plans, all with a 30-day money back guarantee, making the experience completely risk free. The features that come with GreenGeek’s reseller hosting are pretty extensive in our eyes, giving you full control of what you can offer to your own customers. With the ability to brand your own control panel, migrate customers, offer a free hosting billing system, website builder, domain reseller account, and access to 150+ apps, we believe GreenGeeks’ have nailed it on the head with their reseller packages. If you’re still not satisfied, they offer a 30-day money back guarantee. Like many other providers, GreenGeeks also offer VPS hosting, where all of their packages come with management control panel, WHM license, free nightly backups, and migration; all of this on their world leading 300% renewable energy infrastructure – we’re not quite sure how this works but it sounds good! Our experience with GreenGeeks’ cPanel was really quite outstanding, and one of the easiest to use tools we’ve used so far. The one-click install feature is simply brilliant; it’s easy to use and you can install apps, such as, WordPress, Joomla, Drupal and over 150 other apps with the click of a button. This is an especially nice feature for those who are just getting started with their website, or are looking for something easy to use. As well as the one-click installs, GreenGeeks also offer e-commerce options that you can setup and install directly to your website such as, PrestaShop, Magento, ZenCart and OpenCart. GreenGeeks guarantee a 99.9% uptime, which is similar to many other website hosting companies, and the magic number we like to see, especially when it’s guaranteed. Although there is no data on their website supporting this, GreenGeeks must be confident as they include this clause in the service level agreement. We couldn’t find any information on their website, however, regarding what happens if their uptime drops below this point. GreenGeeks host their data center in Chicago, IL in the U.S. where their servers are powered by quad-core processors and around the clock monitoring and a nightly backup. This service comes with all of their hosting packages, unlike some other companies where you have to pay for backups. We checked GreenGeeks response time at Uptrends which came back with the highest response time of 3.3 seconds, and an average of around 1.5 seconds; not the fastest response we’ve seen across some hosting companies, but certainly not the worst, and we can’t really complain if we’re being guaranteed a 99.9% uptime. GreenGeeks offer 3 level of support; email, live chat, and telephone. They even state how quickly each method will take to contact someone and receive a response, e.g. their email support is approximately 15-20minutes wait, live chat is available instantly, and telephone support is available between certain hours of each day. GreenGeeks’ website contains a help center which contains a large number of video tutorials, FAQ’s, and a knowledgebase. We always find it helpful when a company has a knowledgebase as often users can come across some strange issues, and video tutorials in general are a great way of displaying exactly how to perform a task, step by step. Alongside this, GreenGeeks’ website also offer an education center which contains lots of articles with ‘how to’ information, and more step by step guides. We contacted GreenGeek via live chat and email to see how their staff responded to us. The email ticketing system had some great representatives on hand who were very knowledgeable and helped us with our queries. The live chat felt more of a system to use if you have general queries rather than technical queries, based on our experience. GreenGeeks is certainly an interesting choice for web hosting; interesting in the fact that they are ‘green’ and that’s something we don’t see very often. If you’re new to web hosting and require a lot of support to get you going, GreenGeeks might not be the best option for you, given their support isn’t overwhelming, however, they do have a good knowledgebase, and it could be worth a try as you’re guaranteed your money back within 30 days if you don’t like it. However, if you’re a seasoned pro, or well versed with technology, GreenGeeks is affordable, competitive, green, and their services are great. They offer a lot of features within their packages, and don’t shy away from guaranteeing their customers uptime, reliability, and performance. GreenGeeks is a company that is here to stay, with a staff base holding over 40 years of experience in the field, and a CEO who has been around since the beginning, we’re confident that GreenGeeks aren’t just a gimmick, and they really do what they say they’re going to.